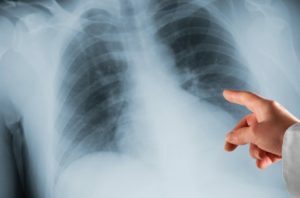 Chlamydophila pneumoniae is a type of bacteria that can lead to lung infections, such as pneumonia. The bacteria cause illness by impairing the lining of the respiratory tract, which includes the throat, windpipe, and lungs. People infected with C. pneumoniae contract the bacteria in their nose, throat, windpipe, and lungs. Moreover, the bacteria can spread from person to person when infected people cough or sneeze while in close contact with others. Anyone can get sick from C. pneumoniae. However, school-aged children or young adults are most commonly infected by the bacteria, while reinfection is most common in older adults. People at a higher risk of C. pneumoniae infection are those who live or work in crowded areas where outbreaks most commonly occur. When a person gets infected by C. pneumoniae, one of its known side effects is a slow-developing cough. Another side effects is a sore throat for a week or more before they develop a cough. If a person with asthma gets infected with the bacteria, asthma flare-up can be triggered. The bacteria can also cause fever and breathing problems, according to an entry published on the website LiveStrong.com. The bacteria can also lead to complications, such as as pneumonia, encephalitis or swelling in the brain, myocarditis or swelling of the heart, and chronic infection. It also causes other respiratory tract infections, such as pharyngitis, tracheitis, sinusitis, otitis media, bronchitis, and bronchiolitis. The body systems harmed by C. pneumoniae are the respiratory and immune systems. There is no information available on what particular foods or nutrients can prevent C. pneumoniae. However, according to an entry published on the website LiveStrong.com, the foods that can help treat C. pneumoniae infection include berries, citrus fruits, dark, leafy greens, winter squash, tomatoes, foods rich in whole grains such as oats, brown rice, quinoa, air-popped popcorn, and barley, and lean protein-rich foods, such as beans, lentils, skinless white-meat poultry, and fish. People infected with C. pneumoniae are usually treated with antibiotics. Chlamydophila pneumoniae is a type of bacteria that can lead to lung infections. C. pneumoniae can cause cough, fever, sore throat, and respiratory problems, such as pharyngitis, tracheitis, sinusitis, otitis media, bronchitis, bronchiolitis, pneumonia. C. pneumoniae can also lead to other complications, such as encephalitis or swelling in the brain, myocarditis or swelling of the heart, and chronic infection. C. pneumoniae affect the respiratory and immune systems.